The Monique property consists of one mining lease and 17 mining claims covering an area of 5.5 km2 located 25 km east of Val-d’Or, in the province of Quebec. The property is located approximately 10 km east of the Beaufor Mine and 50 km from the Corporation’s Camflo Mill. The mining lease was obtained on February 14, 2012, from the ministère de l’Énergie et des Ressources naturelles du Québec, and the environmental certificates of authorization for an open pit operation were received at the beginning of 2013. Open pit mining ended in January 2015, and surface infrastructure was removed during the year. The stockpile remaining at the end of 2015 was processed in the first quarter of 2016 and there was no production at the Monique Mine for the remainder of the year. The Camflo Mill processed 16,063 tonnes of the Monique stockpile at an average grade of 2.31 g/t gold and produced 1,165 ounces of gold for the year. The Monique mine is now closed. On January 16, 2017, Richmont Mines signed an agreement with Probe Metals to sell an interest of up to 60% in the Monique property. Probe needs to make expenditures in the amount of $0.5 million annually, from January 16, 2018 to January 16, 2021. 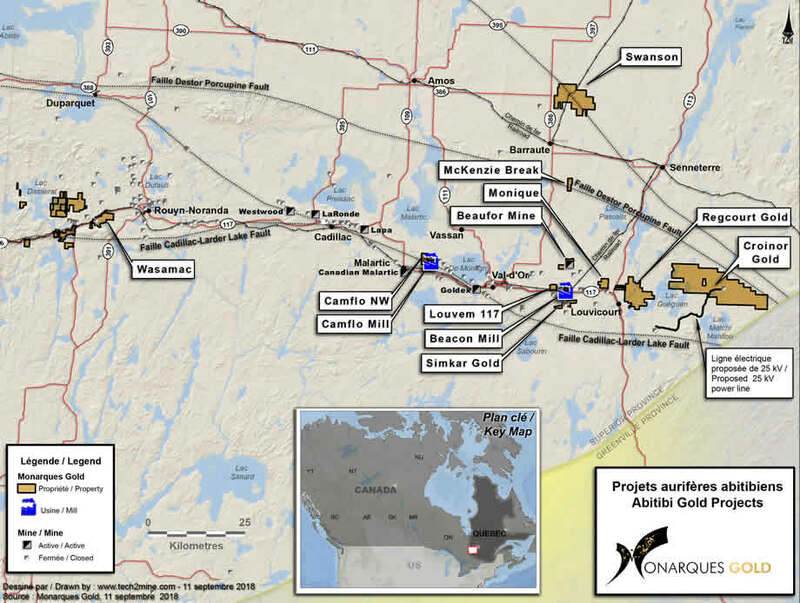 Subject to completion of the option, Monarch Gold will transfer to Probe an undivided 60% legal and beneficial interest in the Monique property and the parties will then form a joint venture. Probe will be the operator with all responsibility for the operations of the property. Probe shall be responsible for the remediation of all surface and environmental disturbances resulting from all activities on the property. The parties shall be responsible for the closure liabilities up to $1.5 million on a pro rata basis and Monarch Gold will be solely responsible for any liabilities in excess of such amount.